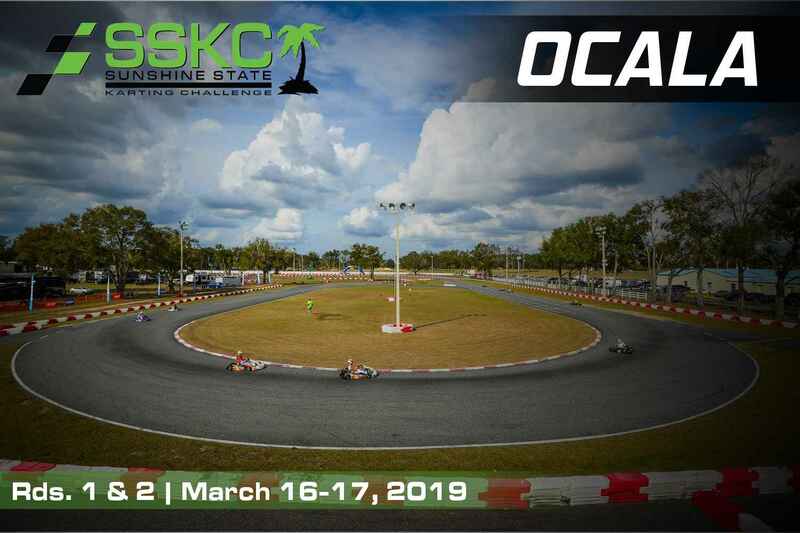 The opening two rounds in the 2019 Sunshine State Karting Challenge take racers to the ever-familiar Ocala Gran Prix in Ocala, Florida. The state championship is set for its second full season, after completing a successful maiden series in 2018. IAME International Final tickets are up for grabs in Mini and Junior, with a number of other contingency prizes upping the prize pool in the rest of the divisions as well. OGP hosted the final two rounds in the 2018 SSKC season, which saw record-high turnouts in numerous classes. Pre-entry numbers have already surpassed each of the three events in 2018, which bids well for the first event held in year two. OGP’s standard counter-clockwise layout is set for action, which measures 6/10ths of a mile in total and features 8 turns. Two divisions that are new for 2019 are the IAME Bambino and Comer C51 Kid Kart classes. Several drivers from Andersen RacePark and AMR Motorplex in Homestead have thrown their hats in the ring to match the Ocala locals. It will be hard to predict the inaugural champion in each class, but the inclusion of the youngest age group on the karting family ladder is always a plus. With most of the 2018 grid advancing up to IAME Mini Swift, a host of new names have filled up the entry list. Enzo Vidmontiene (Benik) was a front-runner in the SKUSA Winter Series, and he joins Carson Weinberg (Nitro) and Asher Ochstein (Benik) in making their first career SSKC starts. St. Petersburg natives Oliver Wheldon (Kosmic / JC Karting) and Kai Johnson (Energy / AKT Racing Team) could make some serious noise after having made a handful of Micro starts last year. TB Kart USA has arguably the strongest regional shifter program in Florida, and they are coming fully loaded to Rounds 1 and 2 with returning podium finishers Vincenzo Sarracino (TB Kart) and Michael Stevens (TB Kart). Team Owner Farshad Bagheri has once again found himself in the seat and will look to give his young superstars a run for their money in the series’ fastest class. 2018 Class Champion Zachary Hollingshead (TB Kart) is back behind the wheel as well, but sporting a different shade of green than in years’ past. Kyffin Simpson (Tony Kart / Speed Concepts Racing) was the first official KA100 entry for the Sunshine State Karting Challenge. He’s joined by Chloe Chambers (Kosmic / Mike Doty Racing) and Marcos Telle (Kosmic / JC Karting), a pair of KA100 Junior regulars. A soft introduction of the motor package brings just one age group for 2019 and marks the third and final new class for the season. One of the biggest divisions set to do battle in Ocala is the Briggs Senior class, which is pushing double digit numbers solely off of pre-entries. RYSA Racing accounts for a big chunk of the entry total, bringing three hot shoes into town with Elvis Faria (BirelART / RYSA), Jack Copeland (BirelART, RYSA), and Frankie Barroso (BirelART / RYSA). They’ll need all the firepower they can muster, though, as TSRacing will once again be fielding Colin Warren (VLR / TS Racing) who nearly went undefeated in his limited starts in 2018. Multi-time podium finisher Miguel Ruiz (TB Kart) is also back and could be a dark horse threat, but a number of newcomers to the series including recent Andersen RacePark winner Jed Perkins (Margay) could shake things up as well. Defending champion Neil Breitenbach (MGM) is set to defend his title in Briggs Heavy. However, last year’s vice champion by a mere 10 points, Jorge Ruiz (TB Kart), is back and will be looking to come out on the other end of the fight in 2019. The pair won’t have it made easy, though, as a number of heavy-hitters from across the state have joined in on the action for this season. RYSA Racing’s Manny Sola (BirelART / RYSA) showed measurable pace in this year’s SKUSA Winter Series. A host of others will also be gunning for last year’s top two finishers in order to stake their claim as the class favorite moving through this season. While the 2018 champion and IAME International Final ticket recipient may have aged out of the division, series vice-champion Max Garcia (Kart Republic / KartSport North America) returns to the series in the same colors that nearly won him the title last year. He is joined by fellow frontrunners Miguel Costa (Parolin / MC Racing) and Michael Costello (Benik) as an early favorite for the championship. Fellow national-level talent Jack Jeffers (Benik / Orsolon) will certainly be in the hunt as well as Tony Kart drivers Anderson Leonard (Tony Kart / SuperTune USA) and Kai Sorensen (Tony Kart / SuperTune USA). Cameron Weinberg (Nitro) has also been strong to start this year, and when you add in 2018 Micro Champion Beckham Jacir (FA Kart / JC Karting), predicting the outcome becomes a little bit tougher. 2018 class champion Colin Warren (TB Kart) finds himself once again with good odds to come out on top, but a win is far from clinched for the Floridian. Brandon Simeone (Kart Republic) has shown measurable pace throughout the state and the opening round of the Florida Winter Tour, and he could be a real threat come this weekend. Jack Copeland (BirelART / RYSA) joins the fray with his first start in an X30-powered BirelART, as he along with Warren will be balancing competing in two classes over the weekend. Miguel Gransaull (TB Kart) is back once again in TaG Master, looking to defend his crown from last year. He’s joined by midwestern veteran drivers Cristian Vomir (TecnoKart USA) and Laurentiu Mardan (TechnoKart USA). Alessandro de Tullio (Exprit / AM Racing Team) comes in riding a wave of momentum from his dominating season in 2018. He’ll be joined by a handful of drivers in the TaG Junior division, including the likes of Canadians Daniel Ali (Kosmic / Racing Edge Motorsports) and Adam Ali (Kosmic / Racing Edge Motorsports) as well as northeastern Junior class sophomore Chloe Chambers (Kosmic / Mike Doty Racing). The second biggest class heading into opening weekend is the IAME X30 Junior division. It arguably is also the most competitive, boasting 2018’s SSKC Mini Swift champion Jeremy Fletcher (Tony Kart / Zanella Racing), Kyffin Simpson (Tony Kart / Speed Concepts Racing), Dylan Christie (Tony Kart / Mike Doty Racing), and Lucas Rodriguez (Tony Kart / P1 Racing) — all of whom have multiple national podiums to their names. Plenty of other drivers with less experience could threaten these top-level pilots, though. Michael Mallardi (BirelART / Andersen) and Hayden Bradley (BirelART / Andersen) both find themselves with one full year of X30 Junior racing under their belts coming into this weekend, which is one more year than what they had at the beginning of 2018.